It is really something that is the aesthetic of the time. Thin black endless wiggly lines on an abstract white background, densifying here, loosening up here only to cuddle in an other heap of completely tangled up strings over her. These abstract patterns are visually fascinating, but why this is, I am not sure. One thing is the abstraction from an obvious continuos activity of some sort, the presence of an invisible repetition, of which one is sure must be there and the forming pattern of density and mess. We have, over the last two, three years learned to recognise these sort of drawings as movement line. Movement of people and animals perhaps, but movement lines quite different from other movement paths previously visualised such as the path of the sun or planets, the movement of shadows or water. It contains the aspects of immediate and real-time decision on the spot, the reaction to a range of influences from large scale, distant events, to the immediate surrounding and interactions with other static or moving objects. It represents in this sense a process as a string of events that were actively dealt with. This aspect of process or in this context better ‘creation’ – in the sense of creating as you go along, of individual actions influenced by background, experience and personality – is a unique characteristic that usually is either underestimated and erase-simplified or over estimated by putting it as random. What exactly is its role in a denser aggregated context? 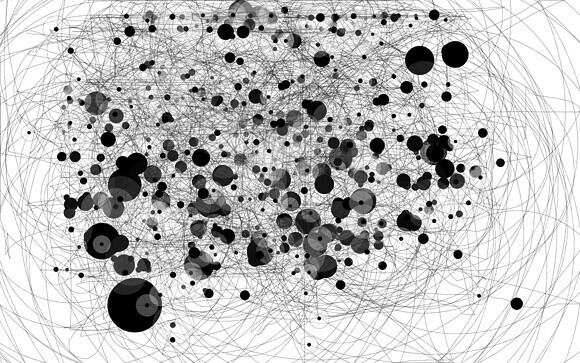 Image by urbanTick / Movement tracking over the period of 1.9 hours working in the evening on some posts and mapping tasks. The activity is captured as curser positions using the software IOGraphica. The visualisation here, come very close to what has been described above, but actually it does not represent any physical movement, it is a simple track map of the curser activity on the computer screen. There are similarities, however the context is extremely confined and designed to work and relate in a specific way. Nevertheless it produces visually interesting images. And if your bored and dont have time to go for a walk, a stole and drift thought the city, let you mouse curser do it for you. The too is called IOGraphica was deveoped by Anatoly Zenkov and Andrey Shipilov and is currently available in v0.9. A tool to run in the background and track you workday at the desk. One started it records each location of the curser as well as the duration, draws lines between them and upon request visualises the time spent per location as growing black dots. Only a few options available but nicely presented. Download from HERE. See some more visuals on flickr. I love it! I have installed on both my Mac Laptop and PC desktop! Awesome! Lets share the images, I had it on all day today on my mac. Can we open a pool on flickr? Just found it, there is a IOGraphica pool on flickr. I have put mine there.